Serpent Starfish, Ophioderma cinereum, come in a variety of colors and sizes. Colors range from gray to purple to maroon. The average size we sell has a body size of about 0.5 inches.Those Starfish are very common starfish found throughout Florida and the Caribbean. They are a very hardy, relatively slow growing starfish that are well suited for any reef tank, and the small size makes them . They can grow to about 1 inch body diameter with arms in the 6 inches range. Some people and books call these starfish brittle stars, and they are closely related, but we prefer to call all the smooth legged starfish serpent stars, and the spiny-legged stars brittle stars. 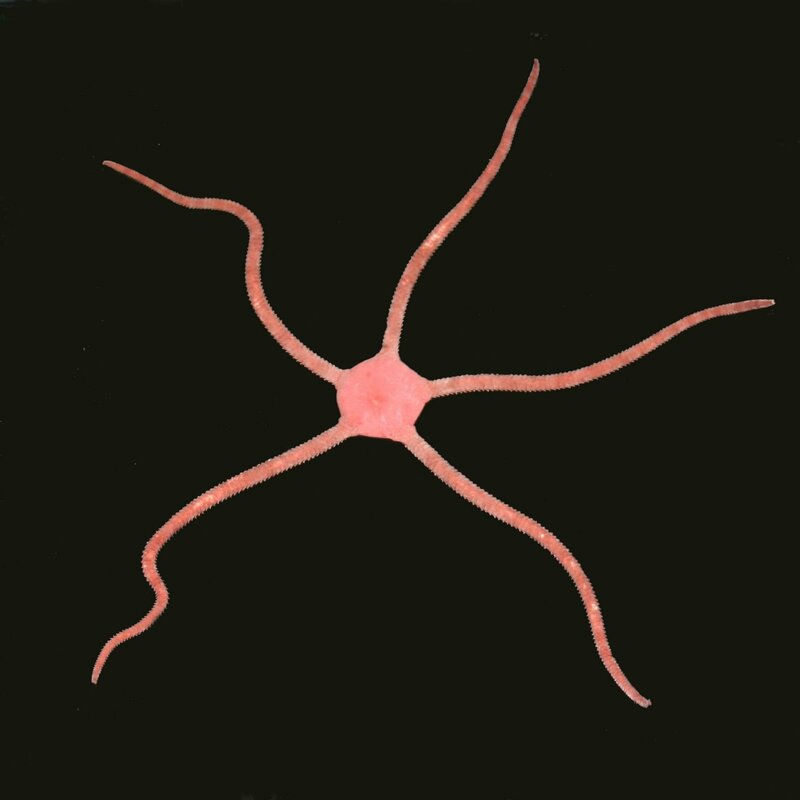 Serpent and brittle stars are easy to care for in an aquarium and will eat most foods offered to them. During the day they will generally hide in dark crevices and under things, but will quickly emerge at feeding time and scavenge for stray bits of food that fall to the bottom, so they make a great addition to your clean up crew, ridding your tank of any un eaten food. They generally get along well with other starfish, and aren’t known to eat corals, anemones, zoanthids, or most other sessile invertebrates. They will eat small clams and flame scallops, so I wouldn’t recommend mixing the two. Very interesting animal. A bit shy but comes out to eat mysis at feeding time. A good neighbor for my peaceful community reef tank except my blenny occasionally steals food from his tentacles! Neat addition to my 90 gallon tank cleans up the sand bed and is awsome to watch!! Ken added this to my order free of charge . THANKS for the great sea life!! This guy is huge..he has taken up residence with my fancy brittlestar! He eats like a pig and is not shy when it’s feeding time! Not so common I got a red and a chocolate colored one great to watch, and finally a animal my eels arent trying to eat.